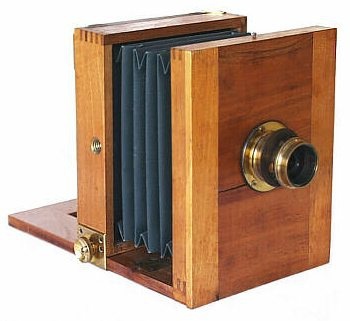 Chambre De Voyage (French for "field camera") is a generic reference for a common style of field view camera sold in France from the 1890s to the 1930s: also known as a "Continental - styled View Camera" or simply "Continental View." Popular on the European continent, the majority of these cameras had the same basic features ranging from simple to elaborate. The Chambre De Voyage is mainly a tailboard camera employing a sliding wooden panel to lock the bed. Although straight forward in design, there were many variations with features such as full rack and pinion focusing, slotted-keyed mounting holes, fine focusing, interchangeable lens boards, shifting front standard, and rotating bellows about the front lens collar. An interesting aspect of the French Field Camera is the bellows. Many had colorful bellows with corner reinforcing in a contrasting color. I have seen examples with blue, purple, pink, red-you name it-bellows. The basic story, as told by another collector, notes that these cameras were almost all made in the Alsace region of France-Germany by cabinet makers who would turn them out during their off-season to keep the shops going and labor employed. Most were nameless but some had name-plates usually of the store, retailer or distributor -- rarely any big names. Occasionally a name-brand maker (e.g. Derogy) would produce a better quality version for people who liked this type of camera and wanted to spend more. Wood was whatever grew nearby, usually adequate quality but not great. Workmanship was competent but not great. This particular camera is a scarce 9 x 12 cm format with a rich forest green bellows. It is a small view camera measuring only 6-1/2" high x 5" wide x 9" long. Construction is purely "no-frills," a primitive model with a fixed lens board, simple unmarked meniscus lens, and fixed (non-rotating) bellows. The wood has a golden oak finish. A crack running across the front lens board attests to the lesser quality wood used in constructing the camera. The camera is nearly identical (if not the same) as the Wunsche field view camera.